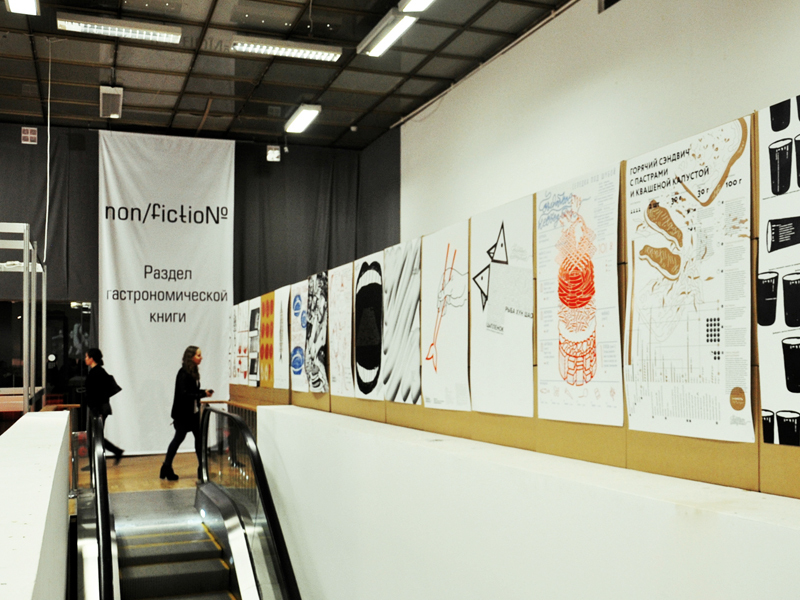 ‘Non/fiction’ is the book fair dedicated to contemporary intellectual literature, annually hosted by Central House of the Artist (Moscow, Russia). Non/fiction receives 30 000 visitors, including professionals related to book publishing, literary critics, and general readers, from 20 participating countries: Belgium, Great Britain, Germany, Greece, Denmark, Hungary, Israel, India, Iceland, Spain, Italy, Canada, Lithuania, Latvia, Norway, Poland, Portugal, Russia, Ukraine, Finland, France, Czech Republic, Sri Lanka, Estonia, Japan. This year a poster exhibition was also presented in the gastronomic literature section. The artists goal was to combine gastronomy and visual art. Yod`s work ‘Herring under a Fur Coat’ dedicated to one of the two most famous Russian salads, was selected to be a part of the event. The exhibition was also attended by famous Russian artists such as Andrei Biljo, Igor Gurovich, Andrey Logvin, Peter Bankov, Alexander Vasin and others.